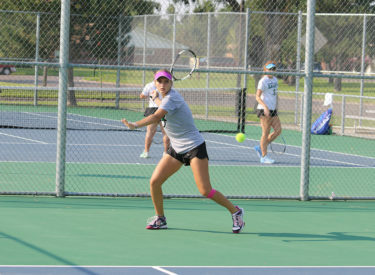 ROSWELL, NM – The Saints and Lady Saints tennis teams played at the New Mexico Military Institute (NMMI) Invite Friday and Saturday with eight Saints and Lady Saints coming away in 1st place in their pools. For the Lady Saints, Patricia Panta won Pool A after defeating teammate Maria Aveiga in the championship match, 6-4, 6-4. Panta got to the championship after beating Mikayla Lopez of NMMI 6-0, 6-2 in the semi-finals. Avegia reached the final match after defeating Francisca Nyarko of NMMI 6-3, 7-5. In Pool B, Alena Marchova also defeated a teammate to win the championship, this time Steffany Bermudez, 6-4, 6-2. Marchova won her semi-final match against Megan Lynch (NMMI) 2-6, 6-1, 10-8. Bermudez beat Emma Oropeza 7-6, 6-4 in the semi-finals. Pool C saw another all-Seward championship match, as Eva Simo defeated Yusra Hegy 7-6, 6-4. Simo came out on top in the semi-finals against Taylor Chapman 6-4, 7-5, while Hegy won her semi-fnal match 6-0, 6-1. In doubles play, the team of Bermudez and Panta defeated the Seward team of Aveiga and Marchova 10-8, 8-6. The team of Hegy and Simo finished in 7th place of the doubles pool. On the men’s side, Tim Lamare won Pool A over Akinori Wada 7-6, 6-3. Pool B featured yet another Seward match with Benji Finet coming out on top of Claudio Quinones 3-6, 6-3, 10-4. In Pool C, Renato Santos defeated Saints teammate Diego Freire 2-6, 6-4, 10-8. In doubles play, the team of Lamar and Santos won the championship match against Seward teammates Finet and Hugo Lobos 10-8, 8-6. Quinones and Franck Soulerot finished doubles play in third place.